It is national Children’s Day in Japan today. Today marks the 70th anniversary of the year when the government of Japan designated the day as a national holiday. Today also marks a sad but true milestone in this blog: this is the 300th post. I have delayed posting a couple of recent developments in the US and Canada as regards the issue of international parental child abduction so that the 300th post would be on Children’s Day in Japan. I will post about those other developments in the coming days. Have a nice Children’s Day in Japan, son. I will send you a further personal message a bit later in the summer. You are welcome to contact me at any time and you don’t need to worry about me telling anyone in Japan about it. Apart from anything else, it has been over 5 years now since I had any proper news about you and, knowing so little, it is very difficult to choose things to buy for you. This month I am (again) increasing the monthly standing order that I send to your mother’s UK bank account. I hope that this money is be being used to help you although, despite the years that I have been doing this for, there has been no acknowledgement of it or confirmation that it is being used or saved for you. As you get older, and particularly if I do not get to hear from you until you are better placed to make decisions for yourself, I am likely to start sending you, directly in Japan, money as well as presents so that (I hope) you will be able to choose something suitable for yourself. 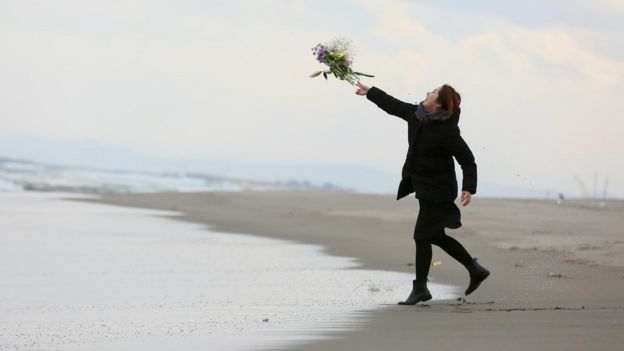 Japan is marking the fifth anniversary of the earthquake and tsunami that left more than 18,000 dead or missing. PM Shinzo Abe and Emperor Akihito are attending a memorial in Tokyo, and joined a moment of silence nationwide at the exact moment the quake hit. The magnitude-9.0 quake struck offshore, creating a vast water surge that devastated the north-east coast. It also triggered the world’s worst nuclear disaster since Chernobyl, at the Fukushima Daiichi nuclear plant. Water inundated the plant, taking cooling systems offline which set off a series of meltdowns. Is Fukushima’s exclusion zone doing more harm than radiation? The subsequent disaster spewed radiation over a wide area and forced the evacuation of more than 160,000 local people. Five years on, most have not been able to return to their homes, despite extensive decontamination work. The earthquake on 11 March 2011 was one of the most powerful ever recorded. But it was the resulting tsunami that claimed the most lives, as a wall of seawater powered through coastal areas of Tohoku, flattening entire towns and villages. 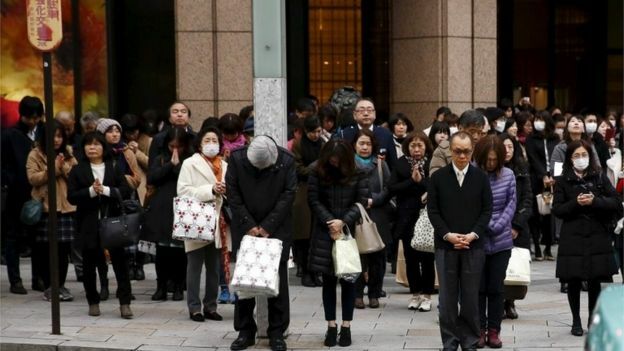 At 14:46 Tokyo time (05:56 GMT), the exact moment the quake was detected, people across Japan bowed their heads as a mark of respect for the victims. Bells rang, and in the capital the underground metro came to halt. “Many of the people affected by the disaster are aging, and I worry that some of them may be suffering alone in places where our eyes and attention don’t reach,” Emperor Akihito said at the ceremony. The day before the anniversary, Prime Minister Shinzo Abe reiterated his government’s commitment to nuclear power, saying Japan “cannot do without it” in the long term. How far has tsunami area come in five years? Nearly 800,000 tons of tainted water is stored in more than 1,000 tanks at the Fukushima plant. No firm plans have been made to dispose of the water. All of Japan’s nuclear power plants were ordered offline amid safety concerns following the Fukushima disaster, forcing it to rely on expensive imported fossil fuels for power. Only a few have since been restarted, despite opposition from residents who say not enough has been done to ensure such a disaster can never happen again. Earlier this week, two plants were ordered to shut down again because of safety fears. Overall 470,000 people were evacuated from the area around Fukushima as the scale of the radiation threat became clear. The government has spent billions of dollars on reconstruction work, but much remains to be done and many have never been able to return. 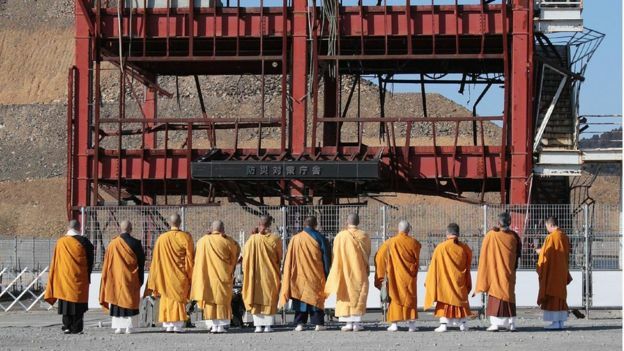 Takagi Tsuyoshi, Japan’s minister of reconstruction, promised the work would be completed. For many survivors though, emotional difficulties are their main concern. “Infrastructure is recovering, hearts are not. I thought time would take care of things,” said Eiki Kumagai, a volunteer fireman. He was in Rikuzentakata, one of the worst hit areas, and lost 51 colleagues in the tsunami.